The last week has been very busy preparing for our open garden event in one week. You can imagine my surprise and shock when I came out of the house to hear a very strange sound coming from our large pond. On close inspection I discovered that the hose to the water fall and rill had separated and the pond had emptied overnight on to the garden. Fortunately I had put the pump on a concrete block so that the pump had not totally drained the pond and the fish were safe. Exactly where all this water went I have no idea but I will not need to water this part of the garden for some time. To give you an idea of the amount of water I have been refilling it with a garden hose turned full on. I estimate it will take up to sixteen hours to replenish the water. So just one more thing to sort out for our open day! At last the last few days we have seen the sun with temperatures up to 28c which is very hot for England at the beginning of May. Yesterday I had noticed a very large toad in our main pond. The sides are steep and I was afraid that it could not get out so I moved it to our more natural pond which has sloping sides so that animals can get in and out easily. As I mentioned last week, this pond is currently full of tadpoles and it seemed an ideal home for the toad. This morning we were showing some friend around the garden and they were fascinated with the number of tadpoles. I mentioned that as it was so warm the grass snakes might come out to feed on the tadpoles. As I said that I noticed the familiar tail of a grass snake. But to my surprise the large toad was being swallowed whole even though the size of the toad was about three times the circumference of the snake. After a few minutes the snake took fright and slid into the pond with the toad still in its mouth. Not a good photo as things were moving quickly however you can see the snake’s mouth and the toad by the reeds on the right with the snake’s body curving to the left in the water. Again the snake was frightened and took off into the undergrowth without the toad. Amazingly the toad was OK apart from a few scratches and a large amount of shock. He has been moved to another pond and seems to be recuperating OK. The snake was about 80cm long and this was the first snake sighting this year. On another nature note the swallows have arrived back some five weeks later than they did last year! The Indian limestone paving by the house was put down about twenty years ago and has started to move losing much of the grout. This is in the process of being lifted and re-bedded and re-grouted. It should be finished in another week. I am not a big fan of daffodils. They look great when they are out but the leaves do hang around for a long time after flowering. The solution I have used to good effect is to plant them around the boundary of the garden which is effectively the back of the beds. The leaves can then be left as other plants grow up in front of them. Iris Histrioides Katherine Hodgkin has been a success elsewhere in the garden. At the end of last year I planted them through the Stone edged circle bed. I was concerned that the squirrels had been having dinner on the bulbs as last month there was no sign of them. However, they are now out and looking great. Over time I hope they will multiply and form a snake through the bed. This little gem flowered for the first time this year. This is Erythronium Snowflake and they were planted in 2015. A long wait but worth it so I may be tempted to buy some more! Another good doer is the corkscrew hazel, Corylus avellana ‘Contorta’, which always has a good display of catkins. A busy week and the average is beginning to grow towards last years average of 20 hours a week. 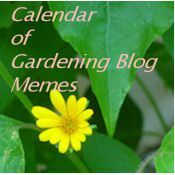 Do have a look at Helen The Patient Gardener’s blog where you fill find links to other gardens at the end of March. Thank you to Helen for hosting this meme.